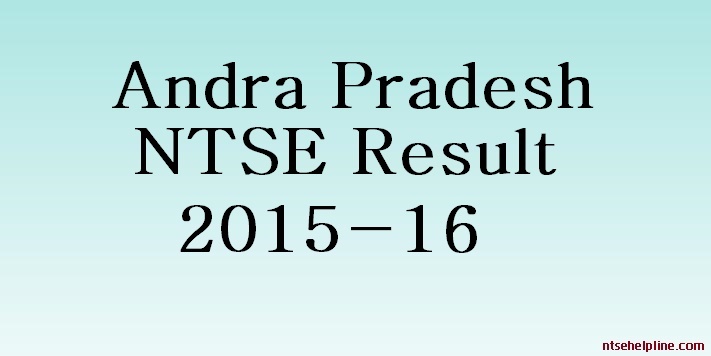 NTSE Stage-1 2019 exam was held on 4th Nov. 2018 at various centers in Andhra Pradesh State. Directorate of Govt. Examinations, AP is also Inviting Objection for the Answer Keys. Students studying in class 10th in the current academic year from any recognized school in Andhra Pradesh including Kendriya Vidhyalayas, Navodaya Samitis and schools affiliated to C.B.S.E. & I.C.S.E. New Delhi. Students must have minimum 60% (for General & 55% for Rest categories) in class 9th. The exam will be conducted in Telugu, English, Urdu & Hindi Medium. *Exam Duration will be 150 minutes for Specially Abled students. Directorate of Government Examinations, Andra Pradesh has declared the result of National level talent search examination 2018 (Stage-I) held on 5th November 2017. Exam result only visible for the candidates who participated in the exam. Qualified candidates will be eligible to participate in the final stage of NTSE 2018 Examination on 13th May (Sunday). Directorate of Government Examinations Andra Pradesh has released the result and the the list of selected candidates of NTSE 2017 Andhra Pradesh (Stage-I) Examination, held on 6th November 2016. Selected Candidates now eligible to participate in the NTSE Stage-II Exam 2017, would be held on 14th May 2017 (Sunday). Candidates not need to apply for the Stage-II as NCERT Delhi (Exam conducting Body) will sent the admit cards and exam centers details directly to the candidates. The Directorate of Government Examinations Andhra Pradesh has released the official notification of the State Level National Talent Search Examination 2017. According to the notification, the NTSE stage 1 examination would be conducted on 6th November 2016. The students studying in 10th class during the academic year 2016-17 across the recognized schools in Andhra Pradesh are eligible to appear for the same. Andra Pradesh National Talent Search Examination 2015-16 result has been declared on 15th Feb 2016 by Directorate of Government Examinations, Andra Pradesh. Total 132 Candidates (97- General, 21- SC, 10- ST, 4-PH) have qualified in NTSE Stage 1 exam held on 8th November in Andra Pradesh. Now these candidates are eligible appear in NTSE stage 2 Scholarship Exam which will be conducted by NCERT Delhi. NTSE Stage 2 Exam will be held on 8th May 2016 (Sunday). The candidates who have been selected for NTSE Stage 2 not required to pay any application fee now.